Life threw lemons at her, she picked them, made lemonade, added sugar, honey and ice! One of the two survivors of 2005 Sosoliso plane crash, Kechi Okwuchi graduated with a First Class degree from University of Thomas Houston, Texas on May 16th, 2015. She was a student of Loyola Jesuit College at the time, a boarding high school in Abuja and was on her way home for the holidays when the crash occurred . 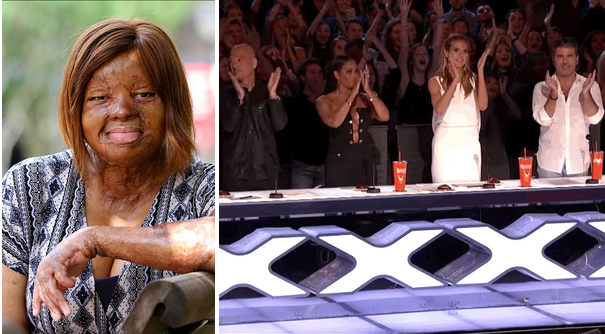 Kechi Okwuchi also gave an outstanding performance at this year’s America’s got talent. Kechi was pictured with two of the judges of the America’s Got Talent show, Simon Cowell, who has proven to be one of the hardest judges to impress and then UK singer Mel B.
Kechi trended online sometime last week after her performance at the show coupled with her story left the judges, audience wowed.